I'm not an alcoholic, I promise. I don't even drink the stuff, and not just because I'm underage. I like water. And tea. And that's about it. But when I saw this recipe in the very first issue of Vegetarian Times that I ever bought, back in March of 2006, I decided I wanted to try it. I searched through the house, and couldn't find any Guinness, and there was no way I could make a "Guinness Cake" with the random bottles of beer I found in the fridge. So I put it in the back of my mind to try sometime, at a later date. And now, almost exactly five years later, I pulled out the magazine and gave the Guinness Cake a try. And I have a pretty good reason. When I'm at home, I have dinner with my great-aunt and uncle on Friday nights. My great-aunt is Irish. She likes beer (thought not Guinness). And yesterday was her birthday. The first detail was irrelevant, but the last two reminded me of this cake, and provided me with the excuse I've needed to try it out. I sent a frazzled mother to the grocery store before breakfast (which, here, starts selling alcohol at 8 AM, meaning she had to wait a while) for beer, gathered up the rest of the ingredients, and whipped up this fairly simple cake. I couldn't get my cocoa/beer/butter mixture to be nicely mixed and smooth, but that didn't seem to ruin the final product. Not even my aunt's dislike of Guinness kept her from liking it, because the cake does not taste like Guinness. 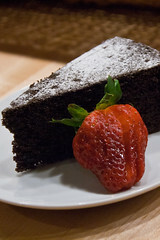 The beer instead seems to add some moisture and depth to the flavor of this nice and simple chocolate cake. Also, like usual, I didn't follow the recipe exactly. We usually have yogurt in the house, so it didn't make sense to go out and buy sour cream unnecessarily. The recipe below reflects the changes. 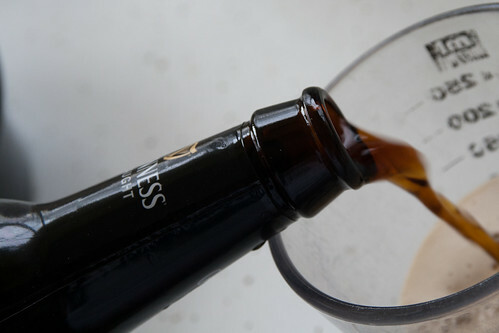 And, for some reason, the recipe on the VT site has a different name than the printed one, and mentions Guinness nowhere. Instead it suggests Darcy's Dublin Stout or Samuel Smith Imperial Stout as examples of black stouts to bake the cake with. Preheat oven to 350ºF. Butter a 9" round pan and line with buttered parchment or dusk with cocoa powder. In a heavy saucepan over medium heat, bring stout and butter to a simmer. Whisk in cocoa until smooth. Cool slightly. In a medium bowl, whisk together flour, sugar, baking soda, and salt. Beat egg, egg yolk, and yogurt with an electric mixer in a large bowl until smooth and blended. Add beer-chocolate mixture and beat to combine. Beat in flour mixture for 15-30 seconds on lowest speed. Fold batter using rubber spatula until completely combined. Don't fold too much. Pour into prepared pan. 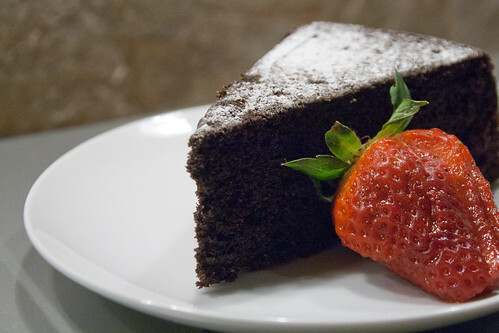 Bake about 45-50 minutes, or until tester inserted into center of cake comes out clean. Cool about 10 minutes on rack. If cake needs loosening from sides of pan, run a small knife around edges. Turn out cake onto rack (if using parchment, peel off) and let cool completely. Sift powdered sugar over top of cake just before serving.